I’m terrified of volcanoes. They possess such almighty power and are completely capable of devastating human lives and their livelihood. With fiery spurts of lava, they wreck destruction on anything in its path. A few frightening examples include Mount Vesuvius’s destruction of Pompeii, Mount St Helens’ 1980 eruption and Mount Merapi’s constant eruptions in Indonesia. Yes, they are awe-inspiring and some people like to get close and personal with them but I chose live an existence of being located very far away from them. Isn’t Australia wonderful with its dormant and extinct volcanoes? A good volcano is a non-active one I say. But really, not all volcanoes spurt out molten rock or have done so in the past. Some volcanoes could actually be ice volcanoes, otherwise known as cryovolcanoes. Instead of erupting with lava, cryovolcanoes eject cryomagma, a cool cocktail of water and gases. Cool, so where are these ice volcanoes? Cryovolcanoes don’t occur on Earth, but in outer space which makes sight-seeing a little difficult even if you’re an astronaut (I’ve handed in my resume and I expect to see a reply soon, NASA). Astronomers theorise that cryovolcanoes could be found on cold celestial objects like Pluto and the moons orbiting Jupiter and Saturn. Of course, another requirement for cyrovolcanoes is the presence of water on that celestial body but this is proving less and less rare in space. The latest discovery on a dwarf planet called Ceres has provided cold hard evidence for cryovolcanoes. 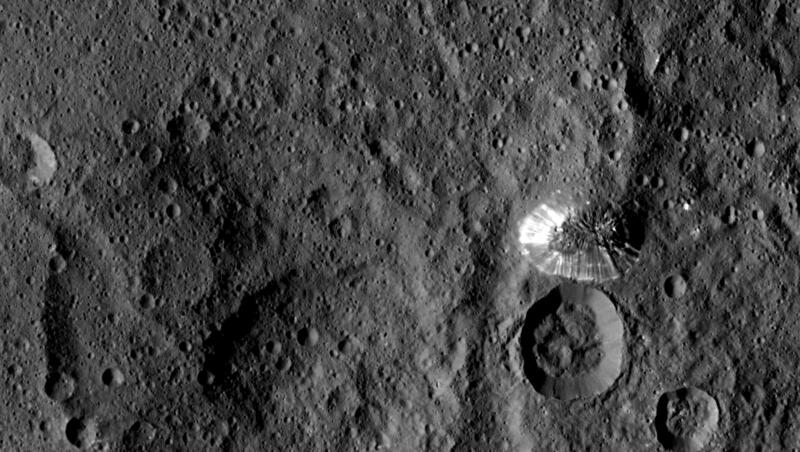 Dawn, a space probe, has been tasked with monitoring Ceres and in 2015, the spacecraft discovered a bright shining mountain on the surface of the planet. In a recent paper published in Science, this mountain, Ahuna Mons, has now been proposed as a cryovolcano. Cryovolcanoes work much in the same way our regular Earth volcanoes do where geothermal energy warms up magma. For cyrovolcanoes, tidal energy provides the heat that warms cryomagma and causes it to turn into a vapour that moves up the mountain. When cryomagma is expelled on the surface, it condenses into ice. Ceres is an interesting case though. Ceres is located far enough away from giant celestial bodies that it experiences negligible tidal energy. So where does it get the energy to heat up cryomagma? Turns out that Ceres could still have some internal heat left over from its formation and this fuels the cryovolcanoes. Additionally, Ahuna Mons is a baby in geographic time scales and the ice that we see surrounding it could have only lasted only about century. This all hints to Ceres being still geographically active. The scientific objective of the Dawn spacecraft is to curate geological information to help answer one of the universes’ big questions – how did our Solar System and its planets form? Volcanic activity is important in shaping the surface of our planets. On rocky celestial bodies like Mercury, volcanic activity could help us understand how these planets came to be. Now with the help of Dawn, the evidence for volcanic activity is mounting for ice bodies too. Ahuna Mons is one chill volcano I wouldn’t mind checking out. Hey NASA, I’m still waiting on that invitation. Hi Marie! I think that would be right, although the type of water might be bit different to our version of water. I’m not sure how common they would be as these ice volcanoes are quite hard to confirm in the first place. All very good questions though! This is a super interesting post Trish, thanks for sharing. I too had never heard of cryovolcanoes before, they sounds fascinating. Does this mean that if they act like volcanoes on earth that spurt out magma from below the earth’s crust, the planets ice volcanoes form on have a “watery” magma? Would they be common on ice giants do you think? I was actually thinking about what the difference between ice volcanoes and geysers are so I don’t think it’s a silly question at all. So I think the cryomagma would contain other things apart from water, so I’m not sure you would really want to get in and go for a swim. I also think that it might be very very hot when it rises out of the core and then it would get extraordinary cold very quickly once on the surface. I’m not sure it would be very easy to find the sweet spot. I think there is some speculation about alien life on these bright spots! It wouldn’t be hard to imagine when you think about all those extremophile bacteria that are heating things up around near geothermal vents. Thanks a bunch, Abigail! I’m glad you enjoyed it 🙂 I didn’t know about ice volcanoes, but they make me think of Fantasy novels. They are pretty unworldly! Nice blog Trish! This sort of news makes me excited for the possibility of space tourism! Although I don’t know if I would even survive the ‘take off’. Vacation to Ceres in 2030? Also does the bright shiny mountain finally prove that aliens exist? Loved this post, being completely honest I had never even heard of cryovolcanoes, though I never spent much time thinking about volcanoes. That however has now changed and I’m spending far to much assignment time distracted by the interesting world of ice volcanoes. The links you included were really useful in this endeavor to spend my time on more interesting things. Hahaha that’s hilarious! I’m a scaredy cat with lots of things but I think being afraid of volcanoes is perfectly valid. It’s actually funny that you mention Hawaii is as well because when I was looking at some random forum, someone was writing about how nervous they were about going there because of the same reason you had. I think the theory has been around since the 1990s and there was some skepticism. Evidence has come by but its probably very hard because of the time it takes do the images to get transmitted back to Earth as well as having a resolution clear enough to try and make out topographical features. From an article I read, it seemed like even NASA wasn’t entirely convinced about Ceres having a cryovolcano but then a few months after, their scientists published the paper that “discovered” it! Your title is brilliant. I too share your fear of volcanoes! I went to Hawaii with my parents when I was 5 and we went inside a volcano! The photo they got for my passport is one of me looking really unhappy, because they’d just told me we were going to go see a volcano! Ice volcanoes sound much less scary. Have we known about them for long?